"I always loved Barre and Pilates but never had time to go to separate classes. Now, with 3BAR I can do all those moves and more and the cardio burn I get from the platform jumps are amazing! I’m hooked!" "Finally, someone took the best workouts and merged them into an amazing product! I love the way the 3 stacked bars gives me everything I need, and the comfortable platform gets me off the floor! Love my new 3BAR!" 3BAR CROSSTRAINER™ Real People. Real Results! CHANGE YOUR BODY! WITH PILATES,BARRE, YOGA & CROSSFIT. With 3BAR your body is the machine and the functional movements will sculpt your body like never seen before. This training method is the future and the most advanced available today and is exclusive to the 3Bar... and its easy and fun to do, so you will see amazing results in weeks not months! 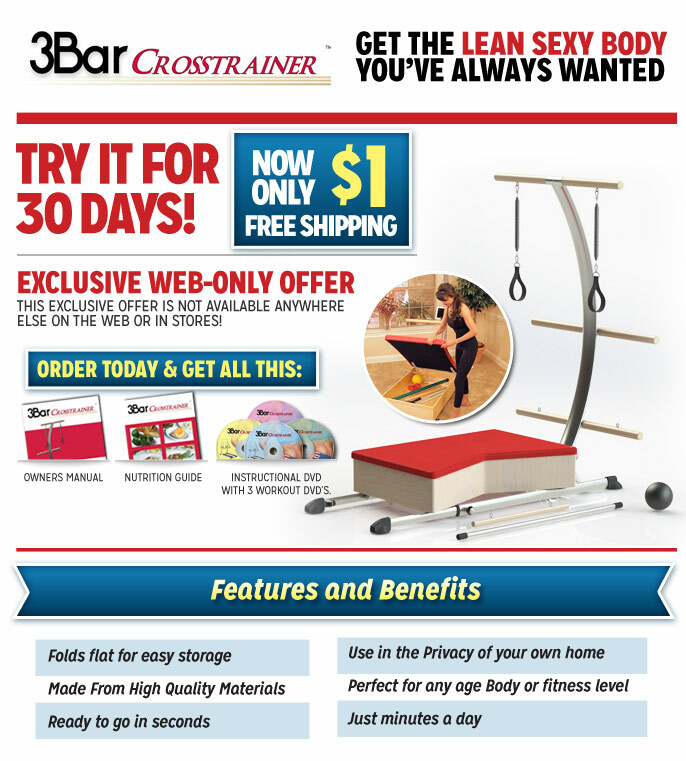 Try 3BAR CROSSTRAINER™ for 30 days in the comfort of your home for only $1.00 plus Free shipping. We know you are going to love the results, but if you are not completely satisfied for any reason, just return the 3BAR CROSSTRAINER™ within the 30-day trial period and you won't owe a penny more. Unless you return the 3BAR CROSSTRAINER™ during the 30 day trial period, you will pay only 13 easy payments of $99.00 each that you authorize 3BAR CROSSTRAINER™ to bill to the card you provide today. If you choose one easy and convenient payment, your card will be charged $1287.00 + FREE Shipping today. 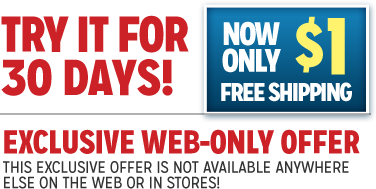 Vitamin trial offer details: We’ll send you a 30 day supply of Fitness Complete daily supplements absolutely free. Then, just before your initial supply runs out, we’ll send you a new 60 day supply for the low price of $29.95 plus $6.95 shipping and processing each month. Each 60 days thereafter, unless you call to cancel, you’ll receive another shipment for that same low price. CA & TX residents add sales tax. Continental U.S., AK and HI orders only. There is a $20 Surcharge per unit shipped to AK and HI.